Maria's life is a testimony to the principles addressed by existential philosophies: freedom, authenticity, responsibility, and moral agency. With balance and courage, she also accepts the inevitable challenges of angst, loneliness, and paralysing uncertainties. Her mind is alive with ideas, concepts, and novel perspectives on human beings. 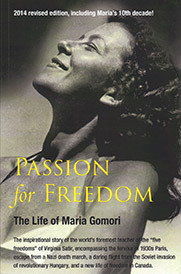 Although her life has been dangerous, dramatic, and tragic at times, Maria does not carry her history as a burden. . . . She relates it in a deeply personal way that fosters enrichment and inspiration for those who hear it. This book is compelling. It will truly amaze and inspire you. You will not be able to put it down. It is amazing that she is still a glamorous woman. What a life!